Safety in the mountains involves moving quickly over varied and difficult terrain. Outdoor Research designed the Women's Verglas Gaiters to carry light and travel fast. Whether you're kicking steps up a fragile snow finger, skinning across a glacier, or negotiating a hairy bushwhack, you can't afford to snag, rip, or be bogged down. Designed specifically for women, these gaiters feature increased volume in the calf and a shorter overall length. 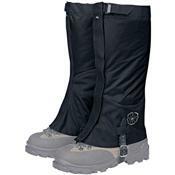 The asymmetrically-cut boot section provides a secure fit with leather or plastic boots, making the Verglas a functional, stout, backpacking gaiter as much as it is a serious mountaineering gaiter. The ultra-light, waterproof, breathable 3-layer Ventia leg section and the coated 500d Cordura boot section make this gaiter a more packable alternative to the OR Crocodiles. A nylon-supported rubber instep strap pulls the gaiter down and flush with your boot to seal out snow and debris. Offset the 1.5in-wide hook-and-loop front closure if you need to make room for insulated pants.